Washington, USA, 13 October 2014: AmSafe Bridport Limited is displaying its Tarian® rocket-propelled grenade (RPG) Armour system at AUSA from 13 – 15 October 2014. This revolutionary, lightweight and durable armour is fitted to General Dynamics Land Systems’ eight-wheeled combat vehicle demonstrator (WCVD) that is representative of both the Stryker and LAV platforms. The WCVD is located on the Kongsberg stand, number 1407. This is the first time AmSafe Bridport’s latest technological advances in passive RPG armour have been shown mounted to a vehicle platform at AUSA. 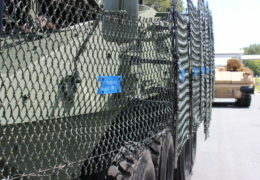 Previously, this vehicle, along with its Tarian® fit, was displayed at the Warfighters Conference in Fort Benning, Georgia where it received substantial interest. Tarian® is a highly effective solution for protection against RPGs and also the world’s lightest. Developed in close collaboration with the UK Ministry of Defence (UK MOD), the Tarian® system has been extensively tested – including over 800 live shots – in the USA, UK and Europe. This testing verified Tarian’s high level of performance and multi-hit capability. Tarian® was first deployed operationally in 2009 and it is now fitted to a variety of British military vehicles, including those in service in Afghanistan, following a $17M order from the UK MOD in 2012. The core element of the Tarian® RPG defeat mechanism is an extremely strong textile net manufactured from high-tenacity fibres. Tarian® defeats the RPG by deforming the nose cone of the RPG, preventing the shaped charge jet from forming. Tarian® nets are attached to vehicles using a robust flexible mounting system to withstand harsh vehicle operating conditions with low susceptibility to damage. Compared with traditional slat armour RPG protection, Tarian® provides significantly improved protection performance and, being significantly lighter, enables vehicles to operate more efficiently regaining lost automotive advantages such as performance, ability to carry more load and better fuel economy. Additionally as it is unobtrusive and easy to operate it greatly enhances vehicle access and furthermore, crew survivability is also greatly improved as Tarian® cannot create a mechanical lock that prevents emergency exit in the event of an accident or blast event. “The WCVD vehicle fit demonstrates the increased need for lightweight, cost effective RPG armour that can restore a vehicle’s performance. Therefore, AmSafe Bridport is delighted to showcase Tarian at AUSA.” – Said Matthew Chuter, RPG Protection Product Line Manager for AmSafe Bridport. Meet the AmSafe Bridport team at AUSA, Washington, USA, from 13 – 15 October, on stand number 6503 and, to view Tarian® fitted on a vehicle, go to the Kongsberg stand, number 1407.